It's Friday and time to wrap up "My Favorite Things"! I have five prizes to give away today. 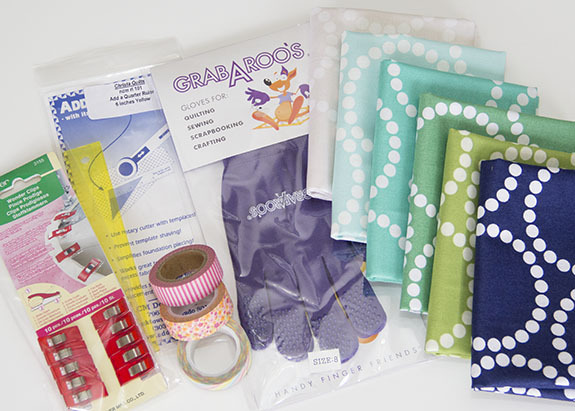 Please leave one comment on this post sharing your favorite sewing tool or fabric. An email address must be available in your linked profile or left as part of the comment. Prizes will be awarded in order of winners drawn. Giveaway ends Wednesday, April 3. Winners will be announced on that date. My favorite sewing thingoo is my fishing tackle box that holds a lot of my other sewing tools and notions! i couldn't live without my Olfa rotary cutter! I have a lot of favorites, but the one that I have been enjoying that I recently added is a wooden seam roller to help with finger pressing open seams. It is a tool used for h working with wallpaper if I remember correctly. Christa Quilts has it, it has helped with pressing seams open easily. Thanks for the giveaway! I love my rotary cutter - I have the same one as you! I love my Hera marker. I only discovered it a few weeks ago and I love using it to make fabrics and quilts for sewing! I currently love my round, rotary cutting mat. I trimmed several hundred half square triangles and it's made that chore sooo much easier. I really love using my hera marker as it is so quick and easy to use it to mark out quilting lines. Thanks for the chance to win ! I do like my marking roller/tool, the new one in purple without "teeth"! Much better than the old ones with teeth! my favorite tool, that i only recently acquired, and absolutely HATE to have to use, is my seam ripper. it's a havel's ultra-pro seam ripper. it's kind of like a scalpel. and it makes short work of my unfortunate mistakes. thanks so much for the giveaway chance!!! Thank you to the chance to win! My favorite is an add a quarter ruler for paper piecing. I would probably say my Olfa light-it has a little supply caddy in the base. It helps so much when sewing at nighr. Hi Kati, I've really enjoyed reading about your quilting adventurs. You are amazing at quilting! I've also really enjoyed your favorite tools posts this week. I even have one or two of these tools already. I don't quilt as well or as much as you do, but I sure do love to choose a pattern and fabric. My favorite tool is my rotary cutter. My favorite quilting tool would have to be my 1/4" foot, for now. A close second is definitely my rotary cutter! I am drooling over your last quilt post of the large star quilt! Simply stunning. Many favorites also but what I can't sew without are my clip on magnifying glasses! Age, wonderful age. I have so come to depend on my rotary cutter to save time in quilting but never could I have imagined the beauty and variety of beautiful fabrics available today when I very first became interested in sewing fifty years ago. Def couldn't live without my Olfa rotary cutter! What a great giveaway. my favorite tool is the mat and rotary cutter. one can't live without the other ! I just hate cutting with scissors ! I love my Prym ergonomic seam ripper as I need a seam ripper way too often... Thanks! My favourite sewing tool is my computer - so I can access amazing blogs and get new ideas! 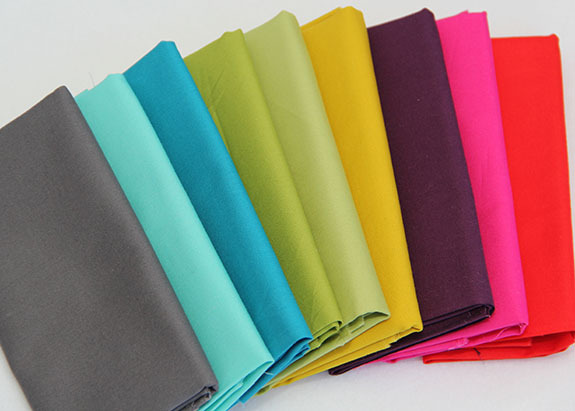 My favourite fabric is Echino - always such nice bright colours and interesting designs. It's hard to say I have a favorite but I do love my magnetic pin bowls. I used to have a fear of dropping a pin and I do pin a lot. Now I always have two going .... one at my pinning station (aka dining room table)and one at the sewing machine to collect them as they come out. Love my Hera marker but my favorite is my homemade ironing board. I used Sharon Schamber's instructions. I keep it on top of my regular ironing board and it sits at right angle to my sewing machine at "sit down" level so all I have to do is swivel to the left to press as I'm sewing. It's much harder than a regular ironing board and I can really press things flat - really great for when piecing or paper piecing. Thanks for the chance to win such a great giveaway. My favourite fabric at the moment has to be that Essex Yarn-dyed, I used it to make a paper pieced pillow for my mum recently and I love it! My favourite tool would be the stork embroidery scissors my mum gave me when Istarted sewing. I think for me, like others, it is the Olfa Rotary cutter. I recently got a more ergonomic one and though it took a bit to get used to, now I love it and could not go back to the old one. Thank you for a great giveaway, and it was very useful to find out about new tools. Oy! Tough choice... Tie between my olfa 60mm cutter, oversized cutting table, gingher scissors and homemade 24x48" ironing board ;) not sure which I could live without! Wow what a great giveaway, thanks for the chance! My favorite sewing tool is painters tape - I use it to mark sewing lines on my machine and for quilting lines for straight line quilting! A fave for me is my iTouch. It keeps me company as I sew and improves my singing tremendously if I turn the volume up. I can sew for hours , murder the lyrics , drown out my swearing when I unsew and best of all no comes down to pester me. ....I get more done. My favorite tool is my sticky clothes roller for removing lint. I use it to clean up my cutting board and blocks and ironing board and tops and everywhere that gets stray threads. For now my favorite tool is my rotary cutter, but I'd like to try some of these others out as well! My favorite tool is my ergonomic rotary cutter. I simply couldn't do without my curved tip sewing scissors. I love them for snipping threads. It prevents me from inadvertently clipping the fabric. Just asked me how I know that!! My favorite things are my ultra-thin glass head pins...don't know how I'd get those seams to line up without them! Thanks for your generous giveaway! Definitely a rotary cutter-couldn't think of quilting without one! My favorite tool is the clover forked pins, I love how well they hold seams together, especially if there extra bulk from lots of points meeting. I loooove my teeny tiny embroidery scissors that live right next to my machine! I also keep a pair of tweezers right there too! As a quilter who started quilting using templates and scissors to cut all my pieces, I must say my favorite tools are a rotary cutter and a quilting ruler - wow, what a difference. Ny newest favorite tool is Clover Wonder Clips. I'm loving wonder clips right now - they're really saving my poor little fingers while attaching binding! I have recently discovered the Hera Marker & it is amazinG! My favorite sewing notion is my rotary cutter. I can't even cut a straight line with a scissors! My favorite tool is my 24 x 36" cutting mat. Makes cutting so much easier. I am new to quilting so I have not used any of the tools that you have listed in your giveaway. But I would love the chance to try them!! One of my favorite things - I use blue painters tape to mark my machine. It really helps to keep me in line. I guess I've started to really take my sewing tools for granted, as I had to think hard here! I have a small rotary mat that swivels, and I really like it for trimming HSTs. No need to reposition the fabric - you just turn the mat. I find they are easier to trim accurately th.at way. Wowyzowy what a giveaway!!! I would say my favourite fabric is Joel Dewberry lime green herringbone from the Modern Meadow line. I'm hoarding a tiny piece and will use it on a rainy day soon I'm sure!! I think I have to go with my clover magnetic pincushion. it makes piecing go so much faster since i don't have to constantly start and stop. i can just chuck the pins toward the cushion and not have to worry about them falling on the ground to be eaten/trampled by the cats and dog. My favorite tool... either my 4"x4" squaring up ruler, my floor lamp aimed right at my machine (I HATE shadows).... or Pinterest! My favorite tool, other than my sewing machine of course, is my rotary cutter. I can't cut straight with scissors to save my life! Rotary cutter and cutting mat = happy happy me. What a lovely giveaway! I would have to say that one of my favorite tools is my rotary cutter...I couldn't imagine having to cut things out with scissors! Soooo nice to have that. I also love my #57 presser foot for perfect 1/4" quilting seams. Thank you for a lovely giveaway....so many nice prizes!!! My favorite tool is the Fiskars Razor point scissors. It is about the size of your old kindergarten scissors, but they are SOOOO sharp, and with the razor point, you can really get into the finest places. The other day I had a thread hook on my presser foot and I couldn't get it with my seam ripper, but my Fiskars got it no problem. I love my sewing weights so I don't have to pin everything when cutting out a pattern. I love my add a quarter inch ruler for paper piecing - thanks for the chance! 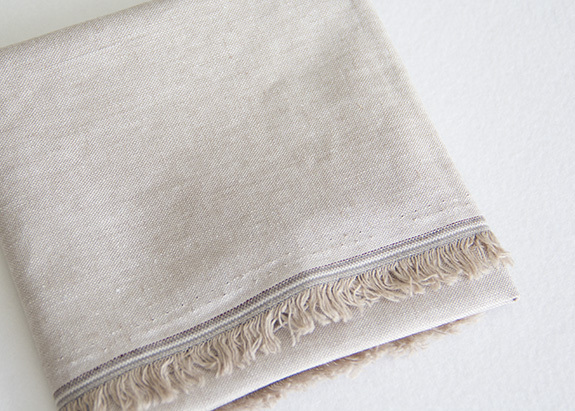 Right now I am in love with Essex Linen. I use it for everything!!! My favorite sewing notion would be Clover Wonder Clips....so many uses instead of pinning! My favorite tool is my sewing machine! And my rotary cutter. Nothing special about it, I just love the part of the process it means I'm at when I get to use either of those tools! Thanks for the incredible giveaway! My favourite sewing notion is my little magnetical sheep wich holds my needle in place on my project when I have to leave my stitchery and do other work.Lol! I hate loving an unpicker/ seam ripper, but I love the Clover one of these. Thanks for the cahcne to win! I love my True-Cut Rotary Blade Sharpener. I use it every day and have razor sharp blades every time I cut. Saves me a fortune in new blades. What a wonderful give away! I know this sounds silly, but I can't live without a seamripper. There are times when things are good and there are times where they are not. I like when my stitches are nice. I love polka dot fabrics and rotary cutters. Where would we be without rotary cutters? My favorite tool truly is my "awl" or as some would call it the "stilleto" . I use it help guide my fabric, I use it to help "hold" fabrics and even find times to use it during my ironing/pressing. I "heart" working with linens, both in garments and in quilting. Such a beautiful, timeless material that just "words"
It has to be a rotary cutter or a seam ripper! Have a nice Easter Holiday! Wow - what a wonderful bunch of favorites! I don't know that I can choose just one, but my current favorite might be my rotary cutter becuase I've been doing a lot of squaring up lately! My favorite tool at the moment is my Clover bias tape maker but the one thing I couldn't live without is my rotary cutter! My favorite tool has got to be my rotary cutter, with a fresh blade! My new favorite fabric is Moda Bella Solids -so many colors, I love Coral. But I'd like to try the ones in your giveaway! My favorite tool has to be my rotary cutter and mats. My biggest personal struggle with quilting is accuracy and I probably get a little too caught up on it, but i feel that my rotary cutter and mats (and rulers) give me a great head start on keeping my project on track and size. This was such a great series of posts and I learned about a lot of thing I didn't know existed. Can't wait to try them out!!! My favorite tool is the rotary cutter, what a time-saver. And the beautiful straight cut lines. I would hate to have to get along without it. Thanks for the opportunity to win your giveaway. Humm Favorite tool! That is a hard choice, so I am left thinking what do I use the most. That would have to be my 6x24 ruler and rotary cutter. And I recently started sewing with Linen and LOVE it! It is just a joy to work with, except the price of course. My favorite tool is my Creative Grids ruler. It's hard to choose just one thing, though. My favorite sewing tool is my trusty seam ripper! Actually, I call it my "unsewing" tool. Fun week and fun giveaway! Thanks! My favorite tool (of the moment) is the Sewline glue pen. So awesome! i recently discovered Thimble-It product...they are tough little stickers to put on your finger when hand sewing (i use them mostly when im sewing my binding down on the back)they are my *new* all time fav. sewing tool. what great prizes, thanks for a chance. I love my rotating cutting mat. It makes trimming a breeze. I bought my mom one for xmas cause I like mine so much! I'm loving all the little bundles of blenders that shops are putting together. Thanks for the chance. Awesome giveaway prizes!!! I'm going to say that my favorite fabric is anything Kate Spain!!! Thanks for the awesome giveaway! I think my favorite tool is my ottlite lamp... can't live without it! Helps me to see the true colors of everything! My favorite fabric is still Ruby by Bonnie and Camille. I love keeping up with what you are making, I get so many inspirational ideas from what you show us, and LOVE your tutorials! Thanks so much! Wow! This is a super giveaway! Thanks for all the work that you put into this! Yes, please! My favorite notion is an old thimble my mother gave me and any new fabric I get at the quilt shop! My favorite sewing tool would probably have to be my clover chaco liner. It is so easy to use and draw chalk lines on my quilts. I use it on almost every quilt I do. My favorite fabric right now is PB&J . So cute! My favorite tool right now are my curved safety pins for basting, I've been doing a bunch of machine quilting lately! My favorite tool is my big, giant triangle ruler. I find myself doing triangles a lot and it has definitely come in handy in more than a few occasions! My favorite fabric right now is anything by Bonnie and Camille! I'm drooling over their new line and can't wait for it to hit the shops! I have a lot of tools that I wouldn't want to be without. One favorite is my iron -- I think it's V50 by Reliable. It's the orange one. I LOVE my dresden ruler - makes them so easy :) - and my favorite fabric right now is Pearl Bracelets. Thanks for the chance! I've really enjoyed this series! What neat giveaways! My current favorite tool is the silly, pink (not really my color) thimble I use for sewing binding. I like the look of the metal ones, but this stays on my finger! Can an automatic bobbin winder be considered a sewing tool? 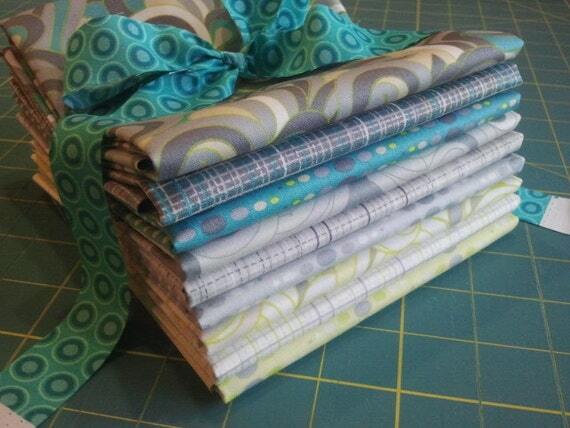 Favorite fabric: Bonnie & Camille's stuff is way cute! Fabulous giveaway! I love my rulers...I'd be lost with out them but same can be said of my rotary cutter! I really love my gypsy gripper. I don't think I would be able to cut yardage without it!! Thanks for the chance to win! I've really enjoyed reading about your favorite things! Rotary blade, I guess I am kinda newbie! Without a doubt the June Tailor Shape Cut slotted "ruler" (can you really call it a ruler?). Love the short work it makes of cutting strips and squares. Just a reminder to anyone who buys one: keep the instruction sheet that comes with it for the 1/4" cutting guides. Great giveaway -- good luck to all!! Thanks for sharing all of your favorite things! My new favorite tool has been my walking foot, although I also love my Creative Grid rulers. Could not do without my rulers and rotary cutter. Thanks for the opportunity to win such nice prizes !! My favorite tools are my rotary cutter and cutting mats! I just bought an ergonomic Olfa rotary cutter, but haven't used it yet. I love my rulers! But they wouldn't be so useful without a rotary cutter. I love my little metal ruler with the slide on it to mark a measurement...not sure what it is called as I have had it for 20 some years. I love large rulers that make big cuts easy and accurate. I love this giveaway!!! What a giveaway you are all so wonderful for such great prizes. My favorite quilting tool is my long arm. I use it for mor than just doing quilting which is my favorite part of the process, but I also make HST, applique, and sew my borders on my quilt. My favorite fabric is Art Gallery Pure Elements and Textures. I've said it before and I'll say it again, I've been using the Olfa brand Rotary since I started quilting 25 years ago. It has been THE most important tool that I use. I'd love to try one of the newer models with easy access to replace blades. Thanks! Great reviews. I love my cut/iron pads! I have a small square one and two large rectangular ones. They are awesome to sit next to my sewing machine and iron as I piece and are flexibe to go on any surface. Thanks for the chance to win such a generous giveaway! My favorite quilting tool is my rotary cutter. My favorite tool is the cutting mat. Wish they made a really big version so I could use it for cutting clothing pieces too. Oh, and my design board. Thanks for such a generous giveaway! My favorite quilting tool is my collection of Omnigrip rulers. They have little grippy bits on the back which help keep them in place when I'm cutting fabric, very helpful! I love my Go! cutter for tricky curvy pieces. I will say that I don't like the Fiskars rotary cutter. Doesn't hold a candle to the Olfas. Thanks for this great giveaway. My favorite notion is steam-a-seam - it's perfect for installing zippers! So much easier than pins. I think my favorite tool is my computer for all of the tutorials I can learn from...a close second is my phone/mp3 player to listen to classic literature on audiobooks...love that when hand quilting! Right now, I am loving my add a quarter ruler. I got hooked on paper piecing at Sew South. Great giveaway, and it was fun reading about your favorite things and all the others in the comments. One of my current favorites is my awl. I sewed through my finger once, and that was enough. Now I use the awl when I need to manipulate fabric close to the needle. My favorite tool ... my 10 x 4 ruler. It is perfect for those small jobs when I don't need to use the big ruler! I would definitely have to go with Wonder Clips. They are SO handy in so many ways! I like to use one of them to keep my tape measure wound up, so it doesn't get tangled in my sewing basket. I couldn't live without self-threading needles. Great giveaway! So many wonderful items! My walking foot! I dont know how I lived without it for so long! My most-used tool, for which I have a love-hate relationship with, is my seam ripper. Ohhhh... what would I do without her? Yet at the same time, I cringe every time I pull her out of the drawer. I absolutely love my rotary cutter! I have quite a few favorite tools, but I really like my new Olfa 17 inch Rotating Mat for trimming large blocks. Thanks for the chance to win such great prizes. So much great stuff to try. My favorite of the moment is my Niagara starch. I just started using it before cutting and my piecing has never looked better. Like everyone else, I love my rotary cutter! Given the fact that I am still a less than perfect seamstress, I should probably say that my favorite tool is a seam ripper. :). Actually, my favorite tool is my rotary cutter and big mat! I'm a pretty new quilter but I'm really loving my rotating cutting mat - I don't have a good cutting area set up and I make more accurate cuts when I can always cut from the same angle. My favorite sewing tool my 24" x 6" Omnigrip ruler. It is perfect for cutting and measuring. It isn't so big that it is unwieldy yet it can tackly 1/2 width of fabric like a champ! My favorite go-to fabric is Kona ash. Thanks for the giveaways. Fingers crossed! Wow! Generous giveaway for sure...and a new blog to follow, love that. My favorite tool is probably my purple thang, next to my rotary cutter and my favorite fabric is anything Art Gallery. It is like working with crisp batik but its regular fabric. Love it! Am I allowed two?! My favourite tools are my 0.5mm mechanical pencil and freezer paper. I use the pencil to mark my sewing lines, after I've ironed on my freezer paper templates - I couldn't manage without these two tools. Oh, and me 1" x 6" ruler, I have four of them! My favorite sewing tool is, well, let's be honest, my seam ripper because it gets so much use! I just put a new blade in my Olfa cutter, so today I love it best! I love all my quilting tools, but I guess my favorite is my rotary cutter. How would I cut without it? Scissors, oh no! Thanks for a wonderful giveaway! Favorite tool - probably my Olfa cutter. Least favorite - seam ripper, but not because it's bad, just because I hate doing it :) Current favorite fabric - the Comma line - awesome! I don't think I can live without my seam ripper. Not even sure what make it is but it slips through the mistake stitches like a hot knife through butter and therefore keeps the swearing to a minimum. Thanks for the chance in a fantastic giveaway! My favorite sewing tool is a super sharp rotary cutter! Favorite fabric is voile as of this week, my first time using it and it's SO soft!! What a wonderful giveaway!!! I think my current favorite notion is the red Wonder Clips, but I only have ten - more would be so great for binding and construction projects. Thanks for the awesome giveaway chance! Well my favorite fabric at this time (even though I LOVE pure elements a really really really lot) are Kaffe Fassett's shot cottons. Loving this giveaway! At the moment my favorite tool is the Olfa rotating cutting mat. So handy! Um, obviously my favorite sewing tool is my seam ripper. What would I do without it?! My fav tool these days are my red wonder clips. They are so cool! HELLO! MY FAVORITE TOOLS ARE MY GINGHER SCISSORS>TINY ONE TO THE LARGE! THANKS FOR SHARING A GREAT GIVEAWAY! My favorite tool is my rotary cutter (45mm) hands down. Love it. I love Pearl Bracelets too. My favorite tool is a fresh rotary blade. I recently purchased a Creative Grids 5 1/2" square and I have to say I love it. The markings are great and it doesn't slip at all. I will slowly be replacing many of my rulers with Creative Grids. My favorite sewing tool is my iPad. I cannot sew without putting on a Netflix movie/TV show! My favourite tool at the moment is a frixion pen whixh I use to mark fabric - it steams off with the iron. I have to admit, I've been getting in the habit of writing the names of the pattern pieces right on the fabric when I'm making bags. So awesome! My favorite tool(s) are my scissors... I have 32 pairs - tiny to large and I love them all! My favorite tools vary with the job. Piecing- Superior or Aurifil thread. Basting- 505 Spray. Quilting- Gloves, Sew Slip, and thread. Your favs are great. Have to give some of them a try. Wonderful giveaways! My favorite tool is my Olfa rotary cutter! What a timesaver and makes cutting quilt pieces so easy and accurate! I think my favorite tool right now is my non-slip ruler and my rotary cutter. Getting that fabric cut right is important! Thanks for the giveaway and the info packed posts on tools. My favorite tool seems to be my Clover seam ripper! I've worn out several! Wow! This is fantastic :) thank you!! My favorite tool? Yikes. I suppose my rotary cutter... I can't.imagine cutting fabric without it! My favorite sewing tool...naptime. Not a tool? I beg to differ! it is as important to sewing as the machine itself! I'm a new quilter, but so far my favorite tool is my Olfa Deluxe Rotary cutter. I love that it's blade pops back in and I don't have to slide it in and out every time I use it. I'm pretty absent minded sometimes and I'm sure I would end up cutting myself if it weren't for that feature. Wonderful giveaway. I just started paper piecing and am loving my quarter inch ruler. Amazing giveaway! Thank you so much! My favorite tool by far is my Olfa rotary cutter. I've tried others and there's no comparison! Fantastic giveaway! I love all my tools but couldn't do without the rotary cutter, rulers and mats. AH! Pick me! Right now, I'm loving my Clover clips so much I have one clipped to my hoody pocket. I've really enjoyed reading the posts this week about favorites. My favorite quilting tool is my computer. I design my own patterns using Illustrator and often spend more time designing than sewing. Need to work on balancing that more. My favorite tool is my rotary cutter! I don't know what I would do without it! i LOVE my rotary cutter!! I need to invest in a good quality one though. I love wonder clips; it makes hand sewing the binding so much easier. My favorite tool is my ergonomic handle seam ripper. Makes it so much nicer to use! What a great giveaway!!! Love all those fabrics too, My favorite gadget right now is my new Baby Lock Melody...brand new machine last week and loving her!! Besides that; my rotary cutter and GoBaby cutter are fantastic!!! 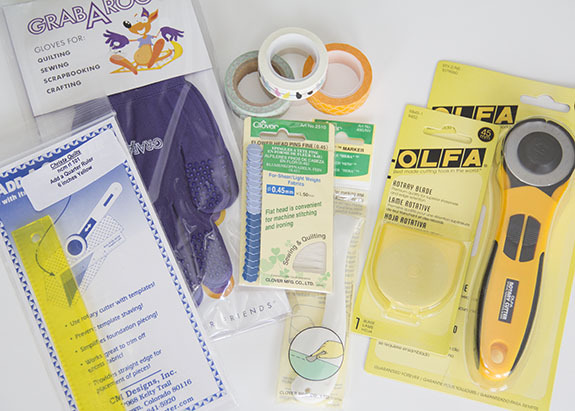 Here are a couple free-motion quilting tools I wouldn't quilt without. A Supreme Slider on the sewing machine bed makes it easier to push the quilt around. And, because quilting gloves are a nuisance to take on and off, I use Neutrogena hand cream to give my hands the "grip" needed to move a quilt around. Neutrogena doesn't leave any residue on a quilt, and is a great hand moisturizer. You should give it a try, Kati. Thanks for the chance to win any of these five super giveaway prizes! I like binding clips. They are holding my papers and fabric together for my EPP hexies and double as hair clips when I let my bangs get too long. My fav tool is my rotary cutter but would love to try the Clover clips. when hand quilting, I can't do without my magnetic top thimble. It holds the needle for me so I don't drop it and end up finding it with my bare feet later! What an awesome giveaway, thank you so much, I need to invest in an Olfa Rotary cutter and then that will be my favorite tool, I am just horrible at cutting fabric with scissors. My favorite sewing tool is my Brite Lite attachment. I love dots & am in love with the Pearl Bracelet fabrics. I love my Westcott 5" titanium scissors. My favorite tool is my little bitty embroidery scissors, but lately I'm loving my frixion pens too. what a fabulous giveaway! Wow! thank you! My favourite tool is my Hera marker - love that I can mark quilting lines and not have to worry about washing anything out! Close behind are all the wonderful threads in my collection.